My full Readercon schedule can be found here. I don’t know that I will actually be reading at the Interfictions 2 reading… or maybe we’re doing the thing where we each read for 2 minutes. I now have something to do on each day. When I’m not on a panel or attending one I’ll probably be hanging around the Prime Books table. There you will find copies of Sybil’s Garage and Electric Velocipede as well as Federations (and whatever else that doesn’t matter to me ;) ). My Week 2 story was complete in the early hours of Sunday morning. But it has no name, so I can’t send it anywhere. Boo! I hate titles. Don’t forget that tomorrow is the Federations NYRSF reading. Click the link for deets and location and such. This is a pretty sad Mother’s Day for me. All of my mothers are gone. 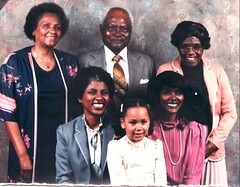 On the top row on the right is my Great-grandmother, Katie Bell Rembert (nee Finley). On the left is her daughter, my grandmother, Anna Ree Tidmore (nee Larkin). On the left in the second row is my mother, Marjorie T Bradford (nee Tidmore). I’ll let you guess who that little yellow child is. Kate died when I was about three years old, well into her 70’s (possibly 80’s). My mother died 9 years ago, but it still really feels like yesterday for me. My grandmother died April 13th of this year at 89. Not pictured is my father’s mother, also no longer with me. She died when I was around 9 or 10. This year I get to remember them instead of sending flowers. So it goes.